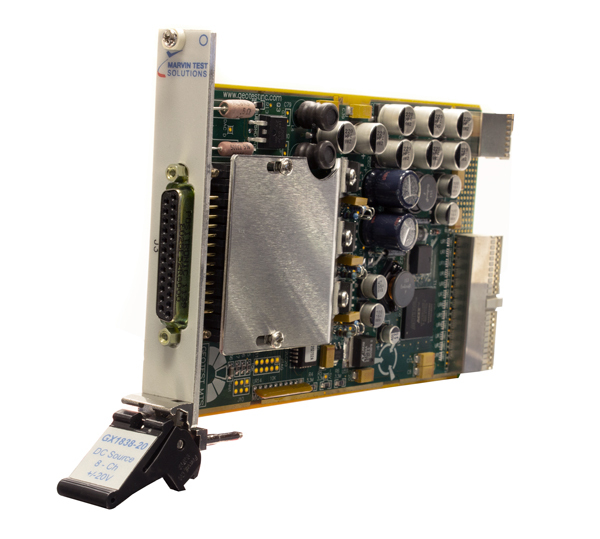 PXI DC Source Card - GX1838 | Marvin Test Solutions, Inc. The GX1838 is a multi-channel programmable DC Source providing multiple discrete outputs for avionics automotive, industrial testing and other ATE applications. The GX1838 provides eight output channels that can either be set as open or switched to any of the three voltage rails. Each of the three voltage rails can be programmed to output -10 VDC to +32 VDC or -20 VDC to +20 VDC with 14-bit resolution. Voltage rails A through C are used as voltage sources which can be connected to a precision digital to analog converter (DAC) or to an external reference input. Rail A can be connected to DAC A or to external reference A. Rail B can be connected to DAC B or to external reference B. Rail C can be connected to DAC C, external reference C, or to ground. This architecture provides for maximum flexibility. If additional output channels are required, an external switch matrix (such as the GX6616) can be used. An on board EEPROM contains the DAC’s calibration parameters and provides for enhanced accuracy. The board is supplied with the GXPDO driver, a software package that includes a virtual instrument panel, and a Windows 32/64-bit DLL driver library and documentation. The virtual panel can be used to interactively program and control the instrument from a window that displays the instrument’s current settings and status. In addition, interface files are provided to support access to programming tools and languages such as ATEasy, LabView, LabView/Real-Time, C/C++, Microsoft Visual Basic®, C#, Delphi, and Pascal. An On-Line help file and PDF User's Guide provides documentation that includes instructions for installing, using and programming the board. *The total maximum current is 500 mA (i.e., if one channel or rail uses the entire 500 mA, the other channels or rails cannot be used). Note: Specifications are subject to change without notice.